Our conference center hotel in St. George, Utah is the ideal place to host your guests in Utah's Dixie. Our guestrooms ensure that you will have a comfortable space to return to after a day of adventure. Our friendly, hard-working staff is always on hand to make sure your needs are met. At Red Lion Hotel & Conference Center St. George, enjoy free parking and free breakfast served daily. Once you are here, feel free to take a dip in our indoor and outdoor pool, then let our whirlpool let you unwind from your long day. If you are here for business travel, our outstanding conference center and meeting facilities will allow you to host a productive event. Entertain your guests after at our onsite restaurant or at one of the many restaurants in St. George. St. George, Utah sits at the convergence of the Great Basin, the Mojave Desert, and the Colorado Plateau. The area's majestic beauty makes it perfect for exploration. Embark on hiking, horseback riding, and caving adventures in the many surrounding national parks. 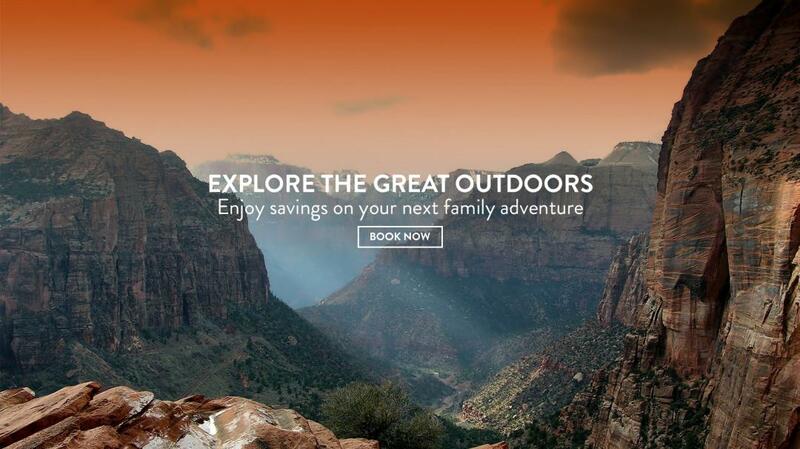 Our hotel is near Zion National Park, where you can experience breathtaking views and fun hikes for the whole family. The area's stunning golf courses are great for a morning game. Take advantage of our getaway packages to get the most from your stay. Enjoy the comforts of home at our hotel in St. George, Utah including spacious rooms and suites. 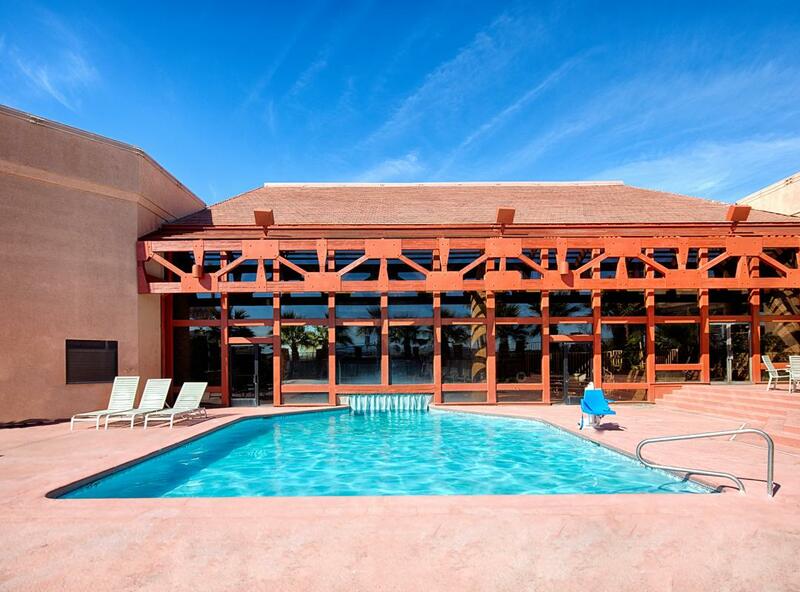 After a long day of traveling take a dip in our heated pool and hot tub or relax in our massage therapy center. After a good night sleep wake up with our complimentary full breakfast from 7:00 a.m. to 10:00 a.m. However long your stay, our friendly staff is always on hand to assist you with whatever your needs are. Pet Policy: All Red Lion Hotels are pet friendly. There is a limit of 2 pets per guest room and pets of any size are welcome. There is a pet fee of $50 per night. Red Lion welcomes service animals, who always stay free. Pets must not be left unattended in guest rooms. Guests traveling with pets may be assigned to pet-designated rooms only. There is excellent St. George dining around our hotel. Sit down for a fantastic meal at one of the many diverse restaurants in St. George, including Mexican, Chinese, and classic American cuisine. More casual options include Pizza Hut and McDonald's, right down the street. Whatever you are craving, you will be able to sate your hunger in St. George. Also make sure to dine at our onsite restaurant. After all, there is no need to leave the hotel for an outstanding meal. Enjoy mouthwatering Mexican fare at The Green Iguana. This restaurant in St. George is conveniently located on-site at our hotel, making it easy for guests to indulge in a delicious meal. The new kitchen will be cooking up a diverse menu for diners, as well as providing the food for banquets at Red Lion Hotel & Conference Center St. George. 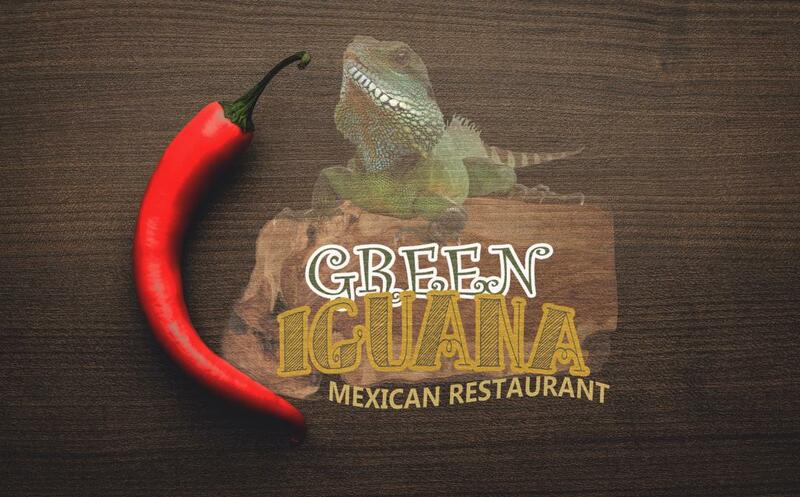 We are excited to be working with local restaurateurs to deliver the best dining experience at The Green Iguana. The restaurant is owned and operated by the family who manages Casa Dona Maria, a renowned Mexican eatery and neighborhood staple near our St. George hotel. From Mexican to Indian to classic American, there is plenty to savor in St. George. We have compiled a list of the three best restaurants in St. George. Whether you are entertaining a client, bringing the family out for dinner, or meeting with friends, these restaurants have unmissable dishes. Street Tacos. Burritos. Sopapillas. Skinny Margaritas. You can enjoy a collection of classic Mexican dishes and more at Peppers Cantina. Locally owned by Rich and Jess Rivera, Peppers is family-operated and a great place to bring your own family. Their two locations make it easy to get the best Mexican food, wherever you are in St. George. Tuesday is also karaoke night at their Sunset location. Belt out some tunes while chowing down on delicious Mexican cuisine. For good, old fashioned hamburgers, fries, and more, head to Black Bear Diner. This restaurant focuses authentic recipes, so you will feel like you are back in Grandma's kitchen. Make sure to see the wooden bear statues throughout the restaurant. Each one is handcrafted and unique. Devour comfort food at its finest. Royal Taj Indian Cuisine has the best Indian food in St. George. With a menu that incorporates both traditional Indian recipes and new, innovative dishes, you will be in for spicy, exotic treats. Their all-you-can-eat lunch buffet, every day from Monday to Saturday, is a great place to entertain clients, family, and friends. 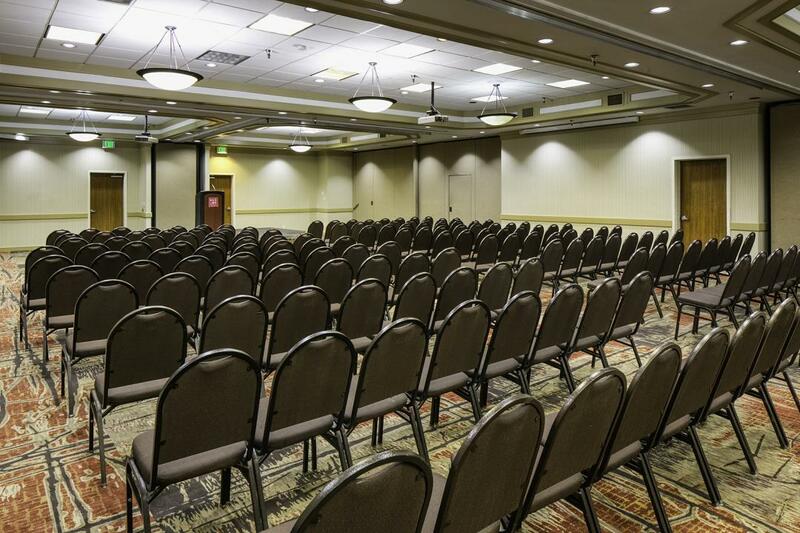 Red Lion Hotel & Conference Center St. George offers up to 5,000 square feet of meeting space, with a maximum capacity of 500 people. For smaller meetings, we have seven breakout rooms, along with an executive board room. Amenities include AV equipment, complimentary Wi-Fi, and business support services. Let your guests recharge with a refreshing lunch break catered by our professional staff. There is no better place to host your St. George events. Contact us at (435) 628-4235 more information on reserving our event venue in St. George. Discover the best things to do in St. George with our travel guide. National Parks allow you to explore Utah's magnificent Western wilderness. Relax in a refreshing spa, or purchase a memorable gift from one of the many shops downtown. The area is replete with family activities, offering attractions for kids and parents to enjoy together. Red Lion St George is a convenient gateway to Zion National Park and to the North Rim of the Grand Canyon. 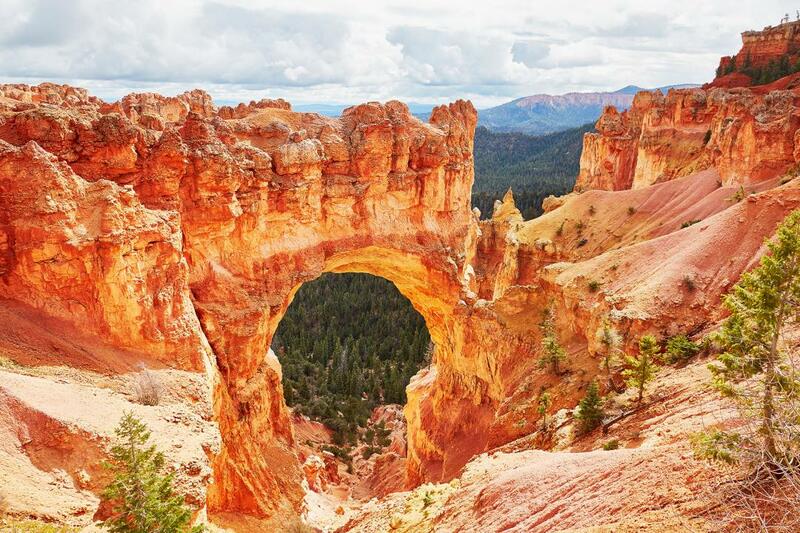 You will also be within driving distance of Bryce Canyon National Park and Cedar Breaks National Monument. The city makes a great base camp for day trips to national parks. Designated in 1919, Zion National Park is Utah's oldest national park. Canyons and spectacular views decorate the hikes along the park, including The Narrows, Subway, and Angels Landing. With nearly three million visitors per year, Zion is Utah's most popular park. Bryce Canyon National Park has thousands of spires rising in brilliant color from its amphitheaters. Eons of wind, water, and geologic events shaped and etched the pink cliffs. The park is surprisingly not actually a canyon, but the Paunsaguant Plateau's eastern slope. 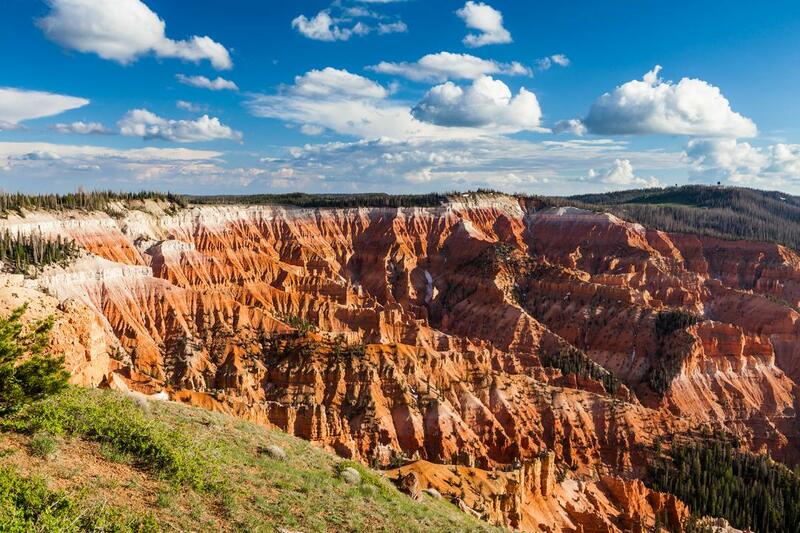 Native Americans dubbed Cedar Breaks the "Circle of Painted Cliffs." This amphitheater drops 2,000 feet to its floor. The intricate spires and canyons are painted in a menagerie of reds, yellows, and purples. The Dixie National Forest is also nearby, and there, you can find some of the world's oldest trees, such as the bristlecone pine tree, along the Spectra Point Trail. With Zion National Park nearby our hotel, along with a host of other smaller state parks, outdoor adventure is endless in St. George. Whether you want a calm hike or a swift sky dive, we have the thrills you are seeking in our desert oasis. Zion National Park and nearby Snow Canyon State Park are both outstanding for hiking. Both experienced and novice hikers will enjoy the stunning red and orange rock mountains, canyons, buttes, and gorges. See petrified dunes, lava flow overlooks, and narrow canyons on your way through these trails. There are challenging, miles-long routes for expert hikers as well as short, calmer routes for family trips. Seeing the red-orange cliff faces will awaken your inner rock climber. Rock Odysseys offers guided rock climbing tours that take you through the most scenic areas of the park. Zion Adventure Company offers half day and full day trips to explore the gorgeous natural formations. Get up close and personal with nature and obtain the thrill of literally overcoming it. With three lakes in the area, you will find plenty of ways to enjoy the waves. First, purchase your adventuring gear at Adventure Plus, which has items for canyoneering, scuba diving, and skim boarding, Zion Outfitter, or Aqua Sports. Sand Hollow State Park, Quail Creek State Park, and Gunlock State Park are three separate parks that make this oasis in the desert a reality. Go boating, fish, or just relax on the beach. Enjoy the waters, however you want. Sure, there is camping, hiking, and boating, but have you tried zip lining? Paragon Adventures lets you zip swiftly across the canyons with the most adrenaline-pumping, scenic tours of the Mojave Canyon. And if you are really looking for thrills, try sky diving. Sky Dive Zion lets you fly at 120 miles per hour thousands of feet above the ground. For a calmer view in the sky, try a hot air balloon tour. Skywalker balloon tours give you stunning views of the canyon. Bring the family on a Southwest vacation they will never forget. There are many things to do with kids in St. George, Utah, and Red Lion gives you access to them. From education museums to the gorgeous outdoors, your kids will find adventure in the Southwestern sun. Visit Fiesta Fun for exciting activities. Splash other people in their bumper boats or go for 18 rounds of mini golf. Try their 20 bowling lanes or their thrilling laser tag course. An arcade and batting cage also add to the fun. Your kids will find plenty of excitement at this family attraction in St. George. The St. George Children's Museum has fun and interactive exhibits for children to explore. The Children's Museum lets kid imagine, discover, and create. Classes and events throughout the week include Beginning Spanish, Exploring Science, Art Basics, and Story Time. The museum also has a musical kid's camp and a summer solstice celebration. Let your kid learn and discover at this energetic, fun museum. The Dinosaur Track Museum is one of the best family activities in St. George. Kids can explore replicas, fossils, and more at this educational museum. It houses well-preserved dinosaur tracks, fossil fish and plants, dinosaur remains, and invertebrate traces. Paleontologists call it one of the best dinosaur track sites in the world. The discoveries here, at Johnson Farm, are some of the most important in Early Jurassic study. Kids will love learning about dinosaurs and seeing replicas, while parents can learn things about the Jurassic period, too. St. George's downtown area has vibrant local shops for you to peruse. Enjoy the treasure hunt at Encore, where you can find gently used women's clothes. Pick up fresh ingredients at the Downtown Farmer's Market at Ancestors Square. You can pick up local produce grown from local farmers. Annie's Vintage Garden has trinkets and decorations to spruce up your garden. If you want a faster way to get around town, head to Bicycles Unlimited to pick up some wheels. There are many spots for a quick eat, too. Rigatti's Wood Fire Pizza has outstanding pizzas. The Bear Paw Cafe has coffee to keep you energized, and Benja Thai & Sushi has Asian cuisine. Spend an afternoon jumping in and out of the many diverse shops in downtown St. George. 2 W. St George Blvd. 43 E. St. George Blvd. 67 E. St. George Blvd. 97 East St George Blvd. Spend an afternoon browsing local stores and outlets. Shopping in St. George features outlets, malls, and local shops. Head to Factory Outlet to get the best brands at low prices, while Red Cliff Shopping Mall has a wide variety of stores for you to explore. St. George downtown also has diverse locally owned shops. The Shoppes at Zion are stocked with name brands and excellent deals. With over 30 shops and restaurants, The Shoppes have plenty of selection. Retailers include Levi’s, Eddie Bauer, and Perfumania. Restaurants include Outback Steakhouse, Capriotti's and Starbucks, so you can refuel while continuing to shop. The Shoppes at Zion are located off I-15 at exit 8. Stop by for an afternoon of Utah's best deals. Red Cliff Shopping Mall has a menagerie of diverse shops. Anchored by Barnes & Noble, Sears, Dillard's, and JCPenney's, the mall also features dining and other stores, including Lane Bryant, Buckle, and Aeropostale. While you are shopping, you also have a chance to take in a movie: Red Cliffs Cinema is right by the mall. Come to St. George for a relaxing and rejuvenating escape. Spas in St. George cater to you from the moment you walk in the door. Hair salons let you come home from your vacation with a whole new style. Be pampered and find peace. One of St. George's best spas is Red Mountain Spa. They have a full spectrum of treatments, filled with sensory pleasures, that will stimulate and heal your skin. Inspired by ancient health and beauty rituals, they blend indigenous desert botanicals, like Utah honey and mineral-rich muds, clays, and salts, to create restorative effects. You can purchase their exclusive products from their spa boutique as well. Indulge in a spa treatment that will leave you rejuvenated and peaceful. A new style is the best souvenir. Come back home with a new hairdo. When you stay at Red Lion St. George, you're near the best salons in St. George. Outer beauty starts with inner beauty, and these spas and salons in St. George help foster inner peace and outer beauty. Here is our list of the three best St. George salons. Centrally located in the heart of the St. George historic district, they pride themselves on attracting the most innovative stylists in the industry. Their services include nail, massage, hair cut/style and skin care, along with a relaxing spa. Passion, energy, and professionalism characterize this salon and day spa. When you stay at Red Lion Hotel & Conference Center St. George, a variety of family activities in Utah are within easy reach. From touring national parks to adventuring down a river to competing with each other at a nearby family fun center, there are so many fun things to do in St. George, that you may need to plan multiple trips. Explore some of our favorite family things to do in Utah to enjoy during your stay. Take a hike! Snow Canyon State Park offers many trails of varying length and difficulty that the whole family can enjoy. Similarly, Zion National Park offers various different hiking options. Younger families will love Lower Emerald Pool trail, which is 1.2 miles long, while older families can undertake the strenuous 5-mile journey to Angels Landing. Head to Virgin River for an adventure like no other. The river flows through the entire area from Zion National Park into the Virgin River Gorge along the Interstate 15 corridor in Arizona. Adventurous families will enjoy class 2, 3, and 4 rapids in the spring as snow in the mountains is just melting. Other families will enjoy the chance to simply float or tube down calmer stretches of the river surrounded by stunning desert landscape. Want all your adventure under one roof? The Fiesta Fun Center in St. George offers popular activities like miniature golf, bumper cars and even arcade games. For something more unique, head to the Tonaquint Nature Center, which offers weekly lectures for families about area wildlife. Also, don't miss out on visiting the St. George Dinosaur Discovery Site at Johnson Farm where many dinosaur remains can be marveled at.